The Saudis, Israelis and New Delhi didn’t want the two visits to take place so close to each other, given that the two countries are seen to be sworn diplomatic antagonists. New Delhi: Saudi Arabia crown prince Mohammed bin Salman will be arriving in India from Malaysia for a fleeting 24-hour visit on 19 February as he looks to not be seen hyphenating Riyadh’s close ties with Pakistan, which he is also visiting on this trip. However, Israel Prime Minister Benjamin Netanyahu, who was also set to visit India on 11 February, has cancelled his day-long trip, said sources. The visit of MBS, as the Saudi crown prince is popularly known, is expected to bolster the strongman image of Prime Minister Narendra Modi. The Central Intelligence Agency in US reportedly concluded in November 2018 that it was MBS who had ordered the killing of Saudi journalist Jamal Khashoggi in Istanbul, Turkey, in October 2018, despite strong denials by the Saudi government. According to the Washington Post, US officials had expressed confidence in the CIA’s assessment despite the fact that this enormously complicates America’s relationship with Saudi Arabia. The reasons for Netanyahu’s cancellation are not clear. In the last two years, Prime Minister Modi and the Israeli PM have already made one trip each to the other’s country. Earlier this month, Israeli national security adviser Meir Bin Shabbat had visited India for talks with his counterpart Ajit Doval. Sources said the Saudis, the Israelis and New Delhi didn’t want the two visits to take place so close to each other, considering Saudi Arabia and Israel are seen to be sworn diplomatic antagonists. February will see the last hurrah of diplomatic visits to India before the upcoming election season — Argentinean President Mauricio Macri will visit on 18 February; besides trips by the former Sri Lanka president Chandrika Kumaratunga to New Delhi, her rival and successor Mahinda Rajapaksa to Bengaluru and former Maldivian president Mohamed Nasheed to New Delhi. Kumaratunga’s proposed talks with Modi will be interesting, especially since India seems to be humouring Rajapaksa despite his intense machinations in recent months in trying to topple the elected government of Ranil Wickramasinghe. Rajapaksa is seen to be close to BJP leader Subramanian Swamy, who has seemingly endeared himself to Modi because of his relentless pursuit of the National Herald case against former Congress president Sonia Gandhi. But it is the visit of MBS which is drawing all the eyeballs these days. The Saudi crown prince will be in the national capital for a mere 24 hours — in on 19 February evening and out on 20 February evening — but Ministry of External Affairs sources said he is bringing with him anything from 500-800 people in their own private jets. Whatever the size of the delegation, fact is that Saudi Arabia has emerged as India’s fourth largest trading partner — after the US, China and UAE — primarily because it is also a top supplier of crude oil, along with Iraq and Iran. Bilateral trade now stands at $27.48 billion, of which India’s imports are $22.06 billion. There is also talk of the Saudis interested in putting together an Investment Fund for India, on the lines of the UAE. The Saudi crown prince who is being heavily criticised by Saudi Arabia’s closest allies such as the UK after journalist Khashoggi’s murder — the CIA said that MBS had ordered the killing — is also being wooed by Islamic nations such as Indonesia, Malaysia and Pakistan. He will be visiting the three nations, besides India, on this trip. 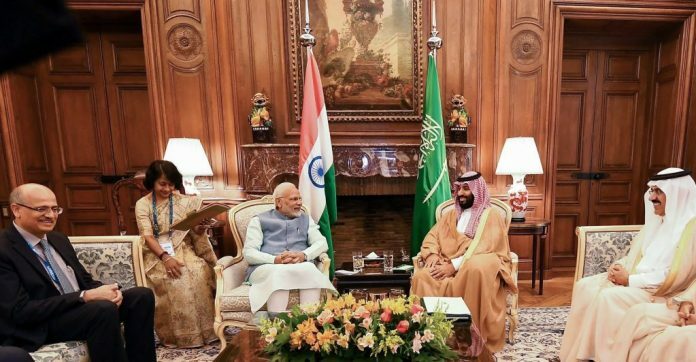 Diplomatic sources in New Delhi told ThePrint that Modi had persuaded MBS to come to India after they both met at the November 2018 G20 summit in Argentina. In Pakistan, MBS is expected to sign pacts worth $14 billion, besides $3 billion in currency support and a loan of another $3 billion in deferred payments for oil imports signed by Pakistan Prime Minister Imran Khan.